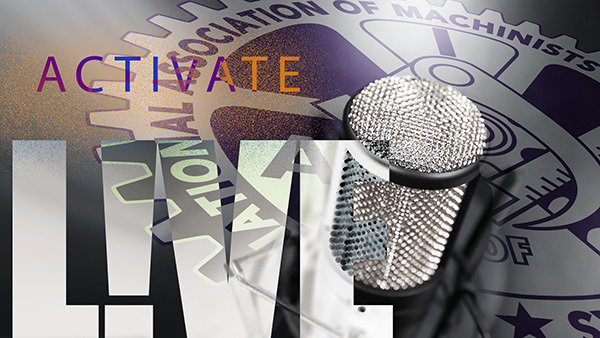 Join the IAM’s live studio webcast of Activate L!VE Wednesday, April 11 at 3 p.m. Eastern. This week’s show will bring you up to date on what’s going on in the IAM. Guests will include District 751 President Jon Holden talking about a new group of IAM members at UTC Aerospace Systems in Everett, WA, who build landing gears for Boeing aircraft. District 54 President T. Dean Wright, Jr. will talk about Local 1285’s successful strike against excavator manufacturer Gradall Industries in New Philadelphia, OH, and Middletown, OH Local 1943 President Neil Douglas will join the program to discuss their apprenticeship program.